Recently I was diagnosed with diabetes Type II, which is not considered a disease so much as a disorder -- a failure of the feedback loop between insulin and the need for insulin, which ought to happen automatically. For some reason this loop either doesn’t make enough insulin or the cells don’t take it in and use it properly. Somehow it is related to the self-regulation of fats and blood pressure as well. The body is a constant stream of chemicals that normally monitors itself. If it doesn’t do that, one has to do it consciously or suffer disabilities. I didn’t react very well to this diagnosis, which I’d been trying to evade. Before I came back to Montana in 1999, I worked for the City of Portland as a clerical specialist. My desk was next to a black woman, a round sweet dependable single mother whose children were grown, and who had diabetes. She’d already had one kidney transplant from her only sister and it rejected, though it was a good match. She was in constant pain and did her own dialysis over the lunch hour by sticking a needle into her abdomen and transfusing a solution that would absorb and excrete. She was dying inch by inch but the City would not approve her for disability and the family needed her income. That’s what diabetes meant to me: a long, painful death sentence -- so I pushed it away. The eye doctor insisted that I go to a doctor right away. I had known my sight was getting blurry but thought it was from bad glasses. I was worrying about glaucoma and cataracts, but didn’t think of diabetes in this way. The eye doctor said the arteries in my eyes were hemorrhaging. That was scary enough to get me to the doctor. She started me off with two medicines for glucose, meant to reduce my blood sugar readings, plus one for high blood pressure. I had been rather expecting this latter, because I’m too fat -- what they call “morbidly obese,” meaning at least a hundred pounds over one’s ideal weight. My ideal weight lasted about a year in my twenties. I got down to 135, trying to keep up with Bob Scriver. (At some point I made an amazing anatomical discovery: my ribs.) Even so, at that time I considered myself too fat and went to a doctor who put me on thyroid pills and amphetamines, rendering me even more emotionally unstable than before. Since that time I weighed about 150 when I began my Animal Control career and about 180 when I broke off to attend seminary in 1978. 200 at the end of seminary. If you had seen me, you’d have guessed less. When I was circuit-riding around Montana, living in a van and eating at Macdonalds, I gained ten pounds or so. Working at a desk for the City of Portland -- surviving on Starbucks for emotional support -- inflated me up to the highest level. Now I’m twenty pounds down from that. Technically no longer morbidly obese. What this means is that suddenly the insulin loop is effective again. My mood lightens, my energy rises, and I don’t have to take the pills, but I DO have to keep stabbing my finger to make sure that everything is still working and that I haven’t eaten something that gums up the works. This is the way Bob Scriver’s diabetes was, too, which recovered after he had suffered a full-scale seizure. A number of other people I know, who’ve never said anything about it, are quietly coping. I discover that people are reluctant to talk about diabetes much, as though it were a character flaw. As though it were, well, cancer or leprosy or TB. The New York Times recently ran a series on diabetes that portrayed it as a plague of poor people with no will-power who constantly scarfed down high calorie food with no nutritional value. They were portrayed as big inflated babies, inflicting upon themselves this malfunction out of stupidity, and -- worst of all -- costing the taxpayers huge amounts of money in amputations, kidney transplants and other ghastly fates. As usual our culture criminalizes and blames the victims, so much so that I sometimes feel we’re slipping towards another holocaust meant to eliminate anyone sick or needy. But among the people I’m finding with Type II, many are physically active, responsible about their health, and careful eaters. A few doctors have whispered that we might be looking at a virus. Maybe a prion. “Illness as metaphor” is a famous concept. Clearly diabetes -- which the older folks around here all call “sugar diabetes” -- is considered a kind of infantile sign, like loving candy. You're too fat and you overindulge in sweet stuff and you're just such an irresponsible child! Reluctance to go have the tests is more about this image than about the disease itself. Glucose is a psychoactive drug. The brain operates on glucose and without it being processed correctly, as when one has diabetes, one can’t think straight about something being wrong. So instead of getting to a doctor, I just went to a bigger font on the computer and grouped stronger lights around my reading chair. Most disabilities, but especially diabetes, offer great marketing opportunities: "durable medical goods," Medicare, pills, little meters, glucose tablets, support groups, coaches, etc. etc. until you're so busy with all that stuff that you have no time to live. (I'm sure Weight Watchers came out of this culture.) I scoff, esp at the “coaches” and groups. But the trouble is that diabetes means doing things differently enough, with enough small changes, with enough questions being raised, that one DOES need a coach and a group. It won’t CURE diabetes, but it helps to manage it, but how does one discriminate between what really helps and what is just marketing -- a coach and a group? The Blackfeet are confronting diabetes with much force and determination. A slender pretty woman named Noney Wolff has been after this problem for a long time. In 1990 I wrote an article about her dietary reminders made from big safety pins with buckskin thongs threaded through beads as reminders for each meal. One thong has a white bead (dairy), green (vegetables), brown (meat) and so on. Then the next thong is the next meal. She also had an amazing collection of plastic food to show people what a normal serving looks like. MUCH smaller than you think! If Noney Wolff gets after you, you can lick anything! Mary Ellen LaFromboise is another one. There is a squadron of dedicated people. Diabetes II IS a disease of old age, machinery getting dull and slow and rusty, so there is the looming ghost of the grim reaper hanging there while you take your readings. My little machine has a 45 second countdown until it shows the number, and my mind races around the room while it ticks. Old, old, old! When the number comes up too low and the little screen shouts, “DANGER! CALL THE DOCTOR!” I’m panicky. But diabetes is reversible in a way that few things are. A bit of effort, some learning, an accumulation of tips and diets and foods, someone who doesn’t mind you blathering on about it -- and all of a sudden I can read again. Got that? It’s a miracle -- I can SEE!! I can shovel the front walk. I have ideas. I’m optimistic. Mary Lee Gold Bales Wippert is one of the dynamic Type II people I’ve discovered. The two of us figure we’ll start a “Farther South Branch” of the Amskapi Pikuni (Southern Blackfeet) Health Project in Valier. Tea, talk, and long walks. It’s not the disease that will hurt you -- it’s not facing the diagnosis. THAT’s deadly! This photo shows John Hellson, expert on Medicine Bundles and other sacred Blackfoot materials, advising Bob Scriver about the figures who would become "The Opening of the Thunder Pipe Bundle." 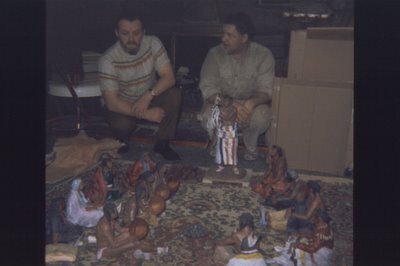 The Pipe Owner is directly in front of Bob Scriver and is a portrait of Charlie Reevis. Each of the figures is a portrait of the people who were actual members of the Bundle Keepers. There are only two living now: whoever it was who posed for the small boy and Joe Old Chief, who was one of the drummers. The blogger has had to regroup and take a few days of “stand-down” to retool. In simple terms I’ve just been diagnosed with Type II diabetes, which means a major change in habits and a huge jump in the attention that has to be paid to eating and exercising. I’m making big charts -- then revising them. I’m supposed to take daily blood pressures, twice-daily blood sugar readings, and a half-hour of walking or the equivalent. (What IS the equivalent to a half-hour of walking?) But it’s working. My blood sugar sank from 200 (very high) to 100 (tolerable) in 24 hours. It’s like cotton candy melting out of my brain. I feel better and I didn’t even realize I didn’t feel good. Being my father’s daughter (my father believed the world could be saved by Popular Mechanics and self-help books), I had at hand some books to guide me. I’ll list them in case you need something similar. I got them from Hamilton remainders online, whose inventory changes all the time. Maybe there’s something new and better by now. “THE GOOD NEWS EATING PLAN for Type II Diabetes” by Elaine Magee. John Wiley & Sons, 1998. “THE GOOD CARB COOKBOOK: Secrets of Eating Low on the Glycemic Index” by Sandra Woodruff. Penguin Putnam, 2001. “THE DIABETIC’S BRAND NAME FOOD EXCHANGE HANDBOOK” BY CLARA G. Schneider. Running Press, 1991. Some time ago I read an article that claimed if a person who had gone slightly to seed in late middle-age or early old-age really got with the program, ten years could be restored to their health. All the years of not drinking/not smoking should count for something. But there is nothing to be done about my posture from hunching over a keyboard all these years -- well, unless I got hip to podcasts!